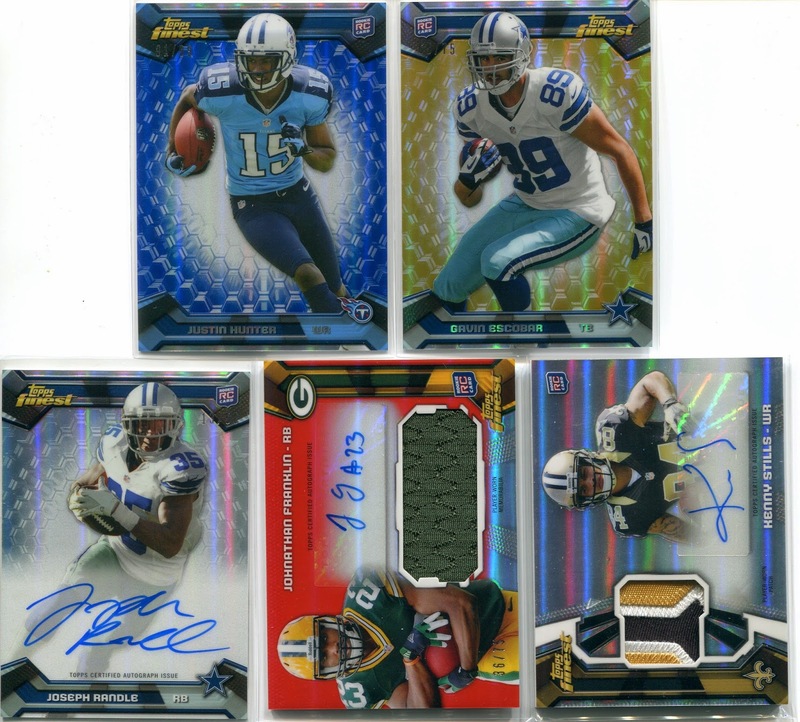 Have you been Jammin in Jammin JDcard breaks? Here are the two scenarios to that question. You have? Great! I guess you have been enjoying some incredible hits such as the ones below or WHAT?!!! ARE YOU CRAZY? WHY NOT? DID YOU LOOK BELOW EVERYONE OF THESE POSTS AT THE HITS?! HOPEFULLY YOU JOIN IN NEXT WEEK! No matter which scenario you fall under, one thing stands true, Jammin has been pulling some great hits from the beginning and hopefully you have not missed out! This past weeks breaks were full of color. 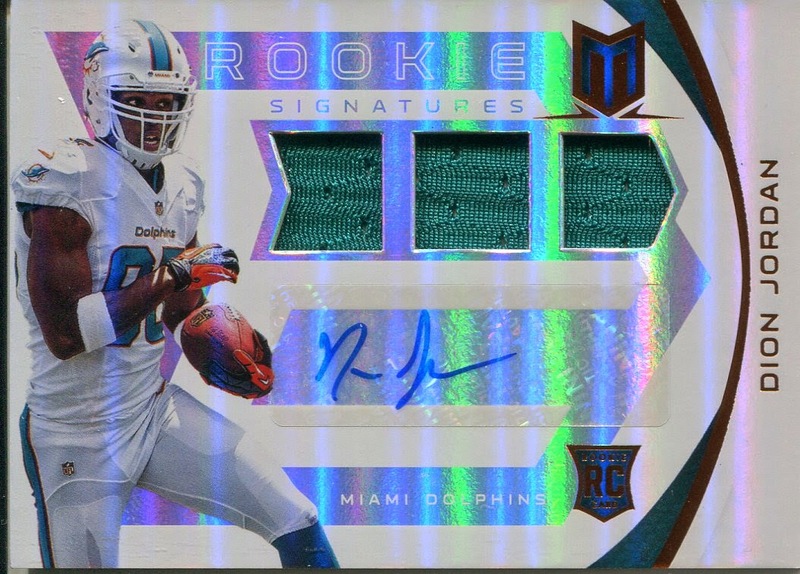 Whether it was the shine from the cards or the incredible multi-color patches, just check them out for yourselves below! 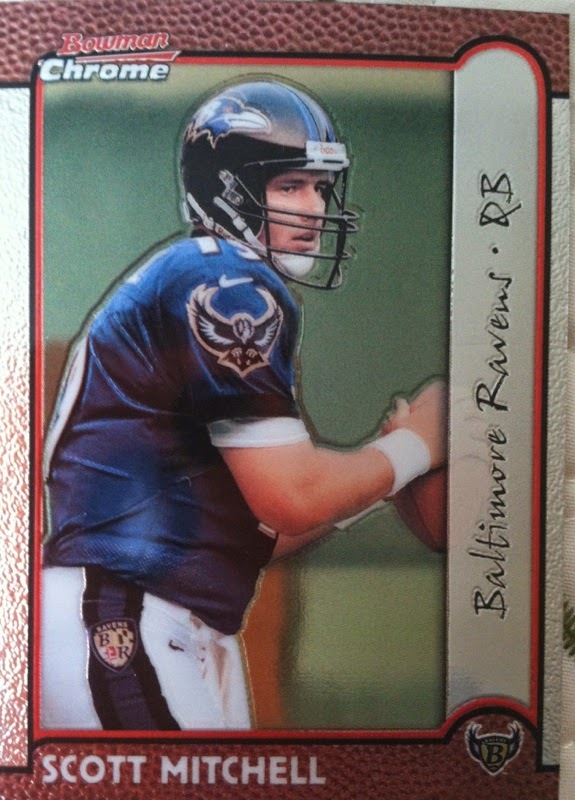 In my premier of the 90's Rip Party segment, I opened up a hobby pack of 1999 Bowman Chrome Football to show you guys the contents. I mean who doesn't love themselves some chrome? 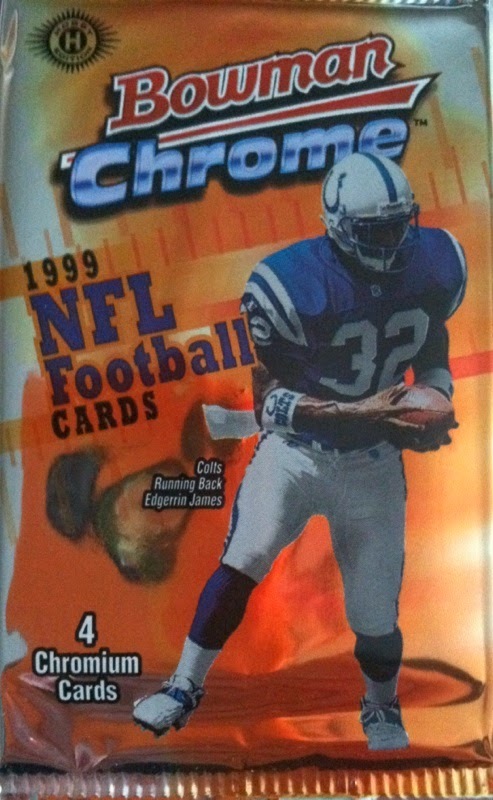 Bowman Chrome football 1999 had 24 packs per box with 4 cards per pack. 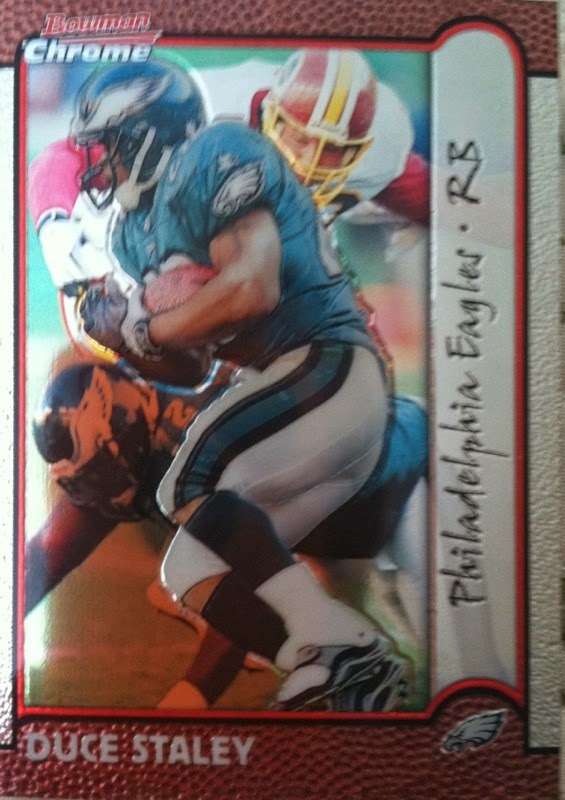 It also had a 220 card base set featuring rookie cards of Donovan McNabb, Edgerrin James, Torry Holt and Ricky Williams to name a few. 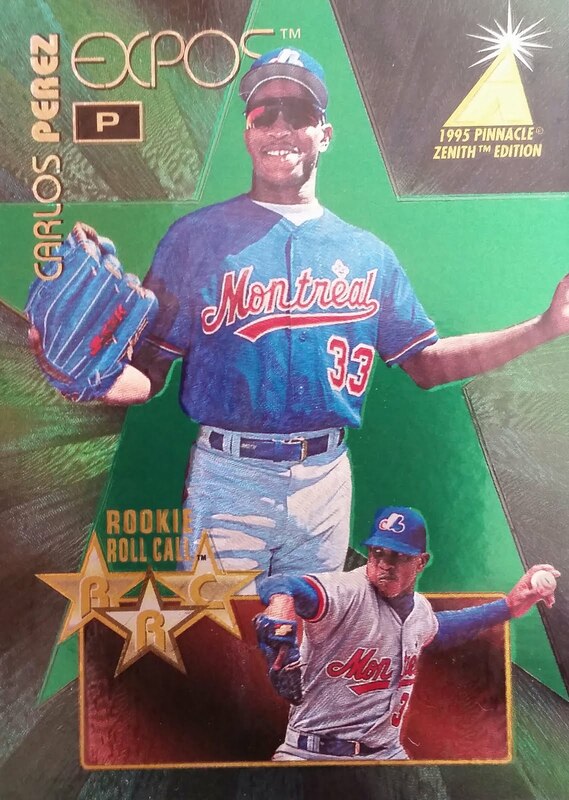 The product also had some of the more popular parallel chases in the hobby at that time with gold parallels, Gold refractors, Interstate, Interstate refractors, and regular chrome refractors so there could be a surprise in any pack. 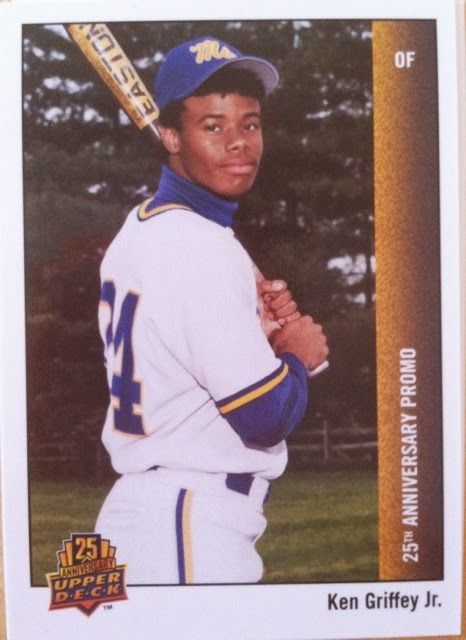 The base card design was one of the better ones for Bowman Chrome over the years. 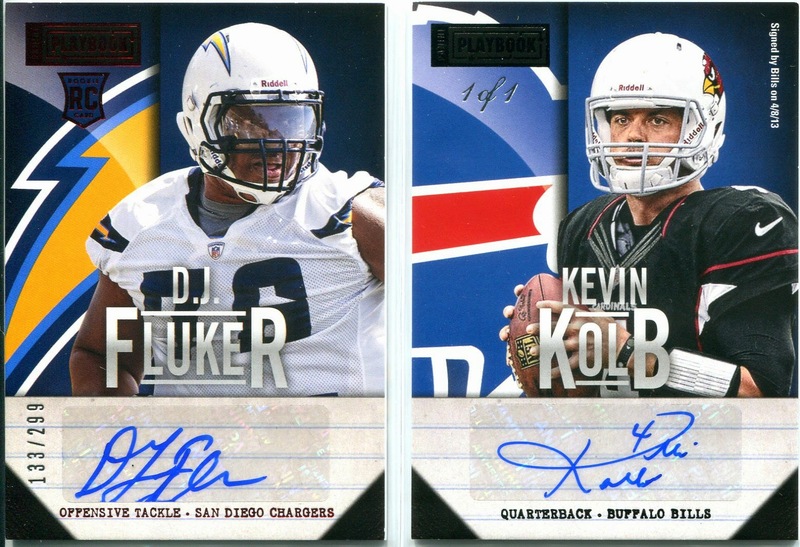 It captured player shots with a football appeal on the top and bottom border, which the bottom border also had the players name and team logo. Finishing up the card on the right hand side was the players team and position. Not a lot of star players in this pack but I enjoyed the rip party not knowing what I could get and looking at the design with the chromium technology is an eye pleasure in itself. 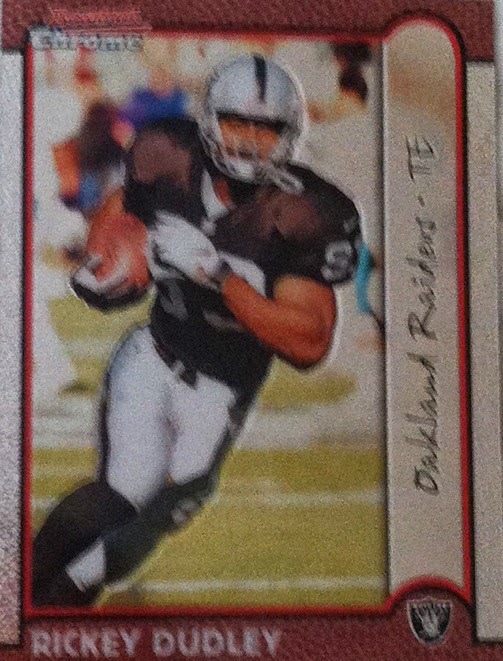 Let me know your thoughts on this rip and if you remember Bowman Chrome 1999 and how you did with the product. Comments are always encouraged here! "That's right Shawn, Gus has got this!" 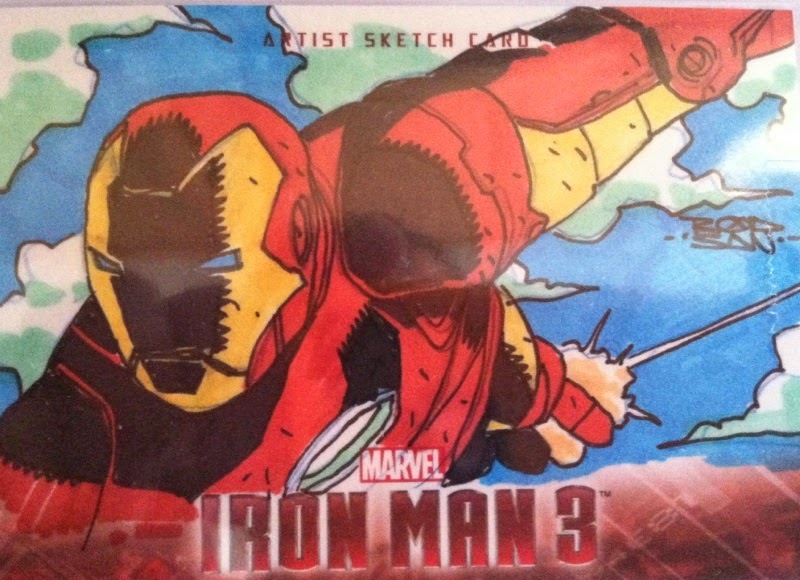 I always enjoy a well done Sketch Card mail day that's 1/1. 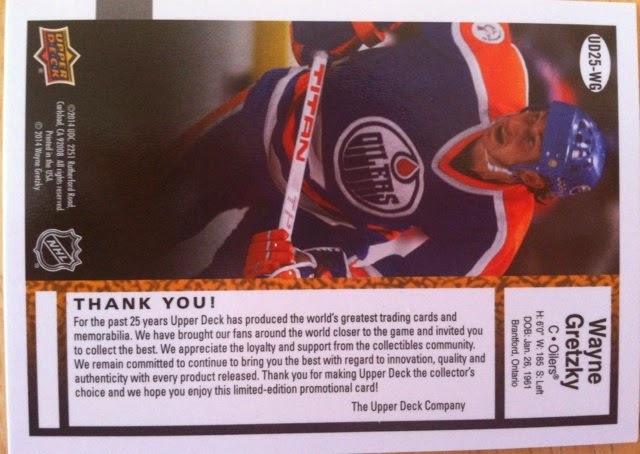 Recently I was able to get my hands onto one of the Upper Deck 25th Anniversary sets, I mean what collector wouldn't want to, so I wanted to show it off to you guys just in case you haven't seen them and may want to try to get a set for your own collection. 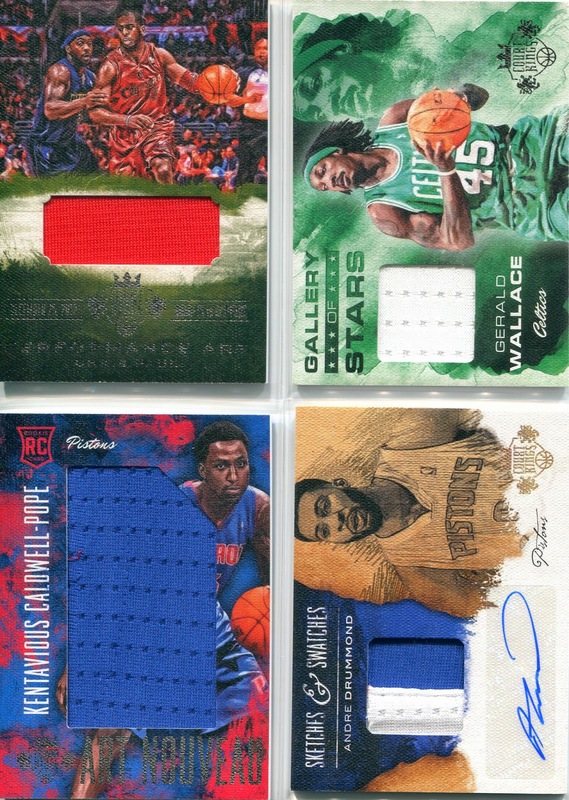 This is a small set but packs a punch with athletes who have made a big impact on Upper Deck over the 25 years (except I couldn't figure out why Michael Jordan wasn't in it) and will continue to make an impact for them for the next 25. How many more titles will this guy win? 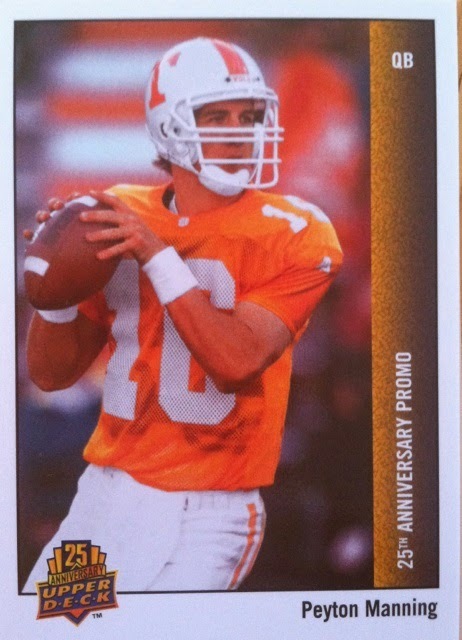 One of my favorite things about the set is the throwback design paying tribute to Upper Deck's beginning set way back in 1989. It also has a modern day look to it. 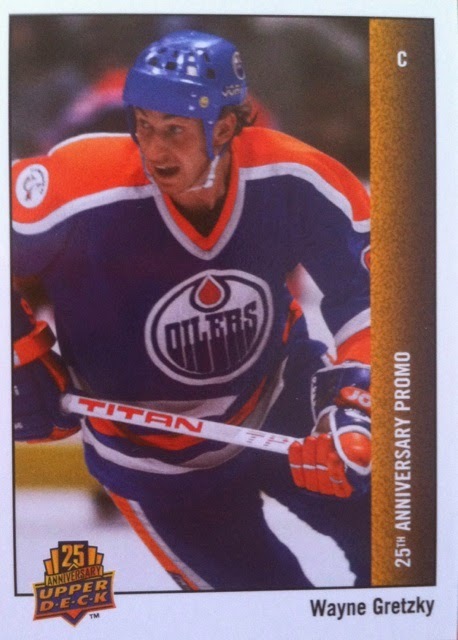 I think this set was a great way to celebrate 25 years of so many things that Upper Deck has brought to the hobby. 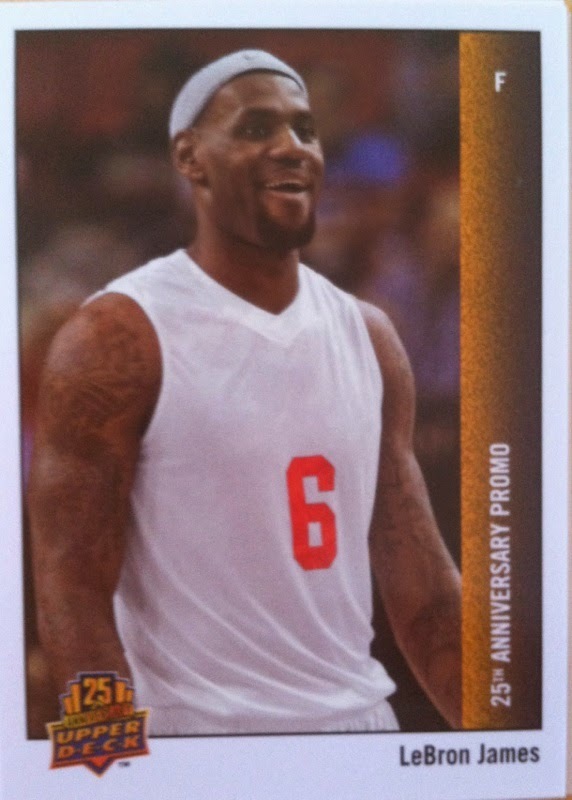 I hope to see them expand upon this set and maybe do a product with a huge insert set of these to chase. 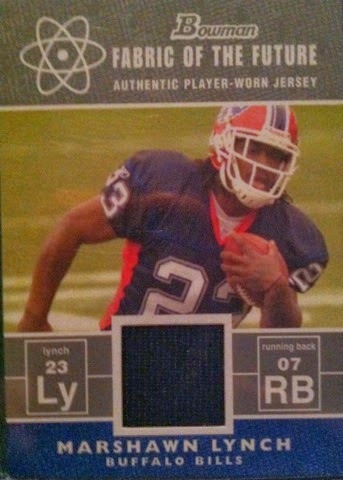 Today's Topic: Your thoughts on "Player Worn" jersey cards as opposed to "Game Used"
Do you think there should even be player worn jersey cards? Do you prefer game used? Does it really matter to you? 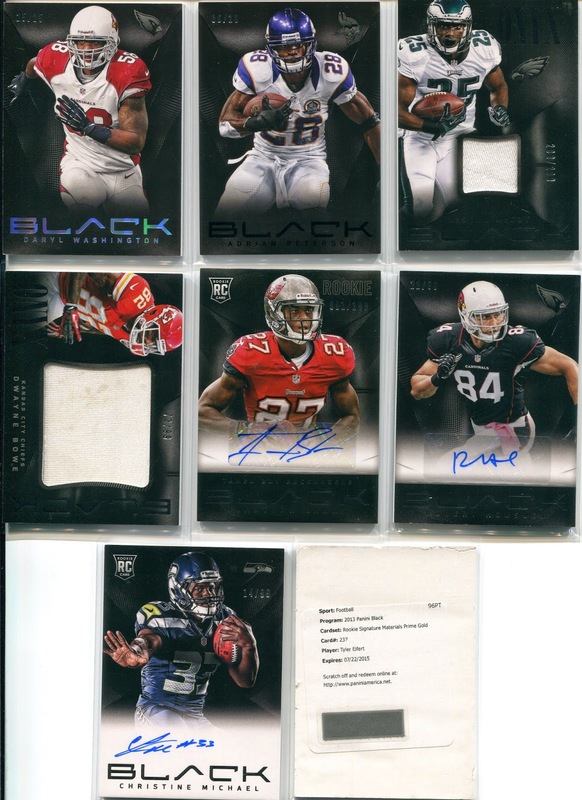 Labels: 2014, Hobby Topic, Jersey card, Sport Card Collectors, Your thoughts on "Player Worn" jersey cards as opposed to "Game Used"
Welcome! Here are the rules, info and prizes on how to play my Monthly Contest challenges. The rules and info will always be the same but the prizes will change! Whether you are a newbie or a returning veteran, I will lay out everything you need to know below. Before I tell you how to play and what you are winning, I first want to say thanks to Jammin JDcards and BCW Supplies for providing prizes for this months contest. Without them, it wouldn't have been possible to bring back this contest for everyone to enjoy again. Now onto how to play. Daily I will post up a game such as L.A. Dodgers vs Arizona Diamondbacks. You must pick the winner of this game by the entry due time. If you pick past the time the entry is due your entry will not count. I will do my best to pick the latest and most challenging games to choose from that way most of you should be able to get your entries in on time. There may be multiple sports to choose from and some may be stats. You will get one point for picking the game right. Zero points for getting the game wrong. The next day will have updated standings with your name and how many total points you have up to that point. This will be on a separate post you will find in our new tab at the top of the blog marked Monthly Contest. The FINAL 3 days of the contest will have you bidding the points you won in the first 17 days. 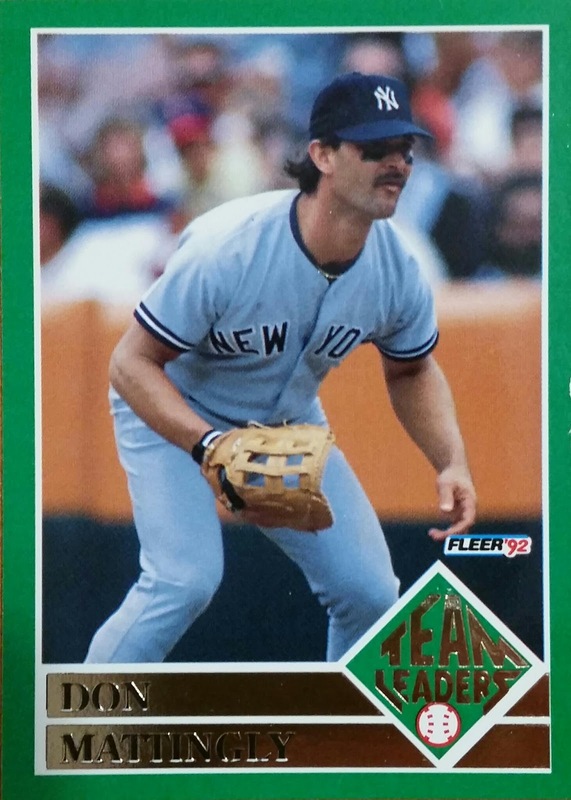 For example, if you have 10 points and want to bid 5 of them on picking the Yankees over the Blue Jays and the Yankees win you get the five points and will have 15 total points. However, if you get it wrong you will lose the 5 points and will have 5 total points. You can never bid over the amount of points you have. Meaning if you have 5 points, you can't bid 6 or more. Once you run out of points you are eliminated out of the game so please make sure you use your points wisely. The three with the most points at the end of the 20 days will win prizes. You must enter the contest before Day 17 in order to enter the final 3 days to win prizes. You can however enter the contest at any point, but why would you wait til the final days to enter with 1 or 2 points? Now onto the winnings. I usually I have a 1st, 2nd and 3rd place prize. But not this time. I think all of these prizes are pretty equal and will allow the winner to choose which prize they want. After that, the second place winner picks their prize and the third place winner gets the remaining prize. Depending on how Aprils contest goes and the turnout, there may be other future prizes added to the list to choose from. 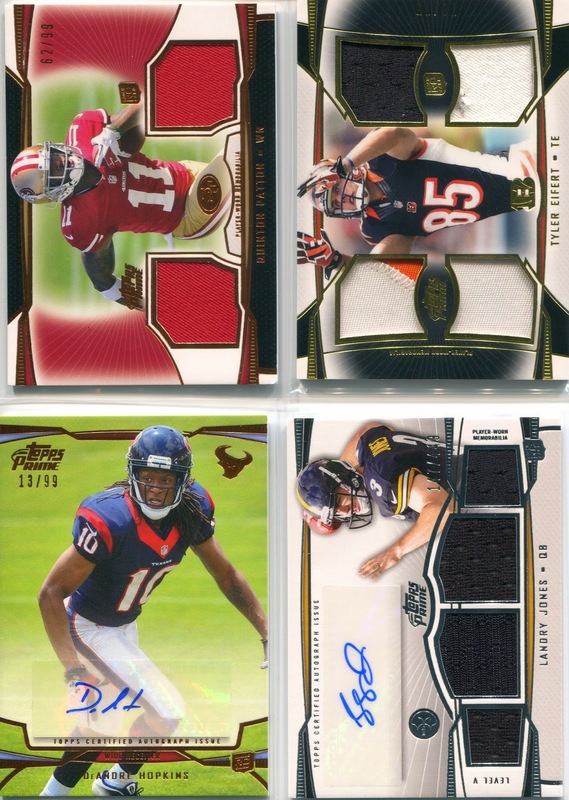 But I think BCW Supplies and Jammin JDcards put out some pretty good ones up for grabs this month. IF YOUR NAME IS IN BLACK AND BOLD YOU ARE ELIMINATED FROM THIS CONTEST. YOU CANNOT WIN THE PRIZES. WE HOPE YOU COME BACK NEXT MONTH AND GOOD LUCK IN MAY! NEW SETUP! Poll Friday: Which Companies Do You Buy Cards Of? RESULTS! Another poll has come to a close and now it's time to give you the results! For the second straight week, voters were down. This week only 9 of you voted making this not a very well rounded poll but I at least have some answers from you. 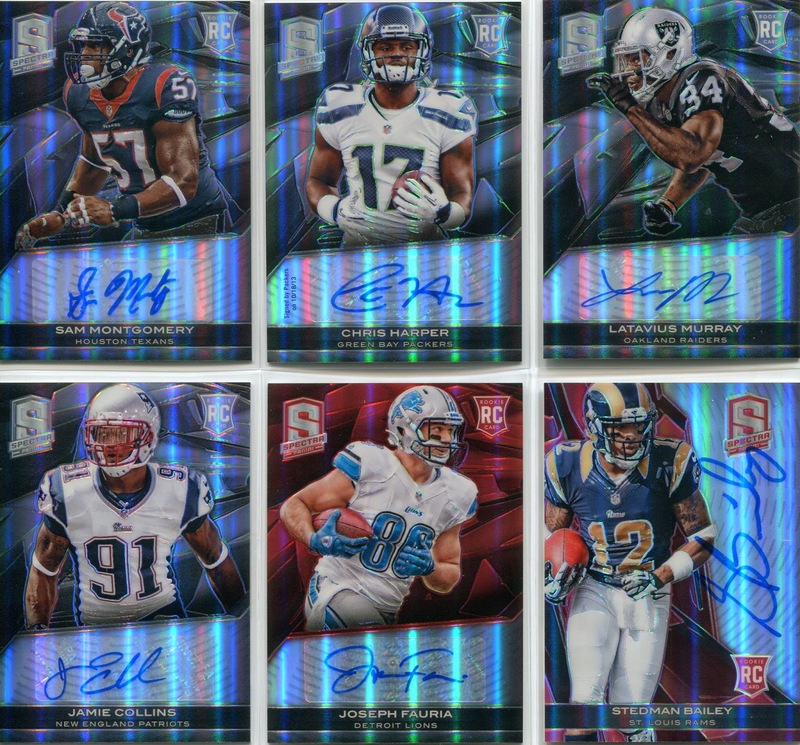 Seems like you guys are split down the middle on Panini and Upper Deck and most of you lean towards Topps. Leaf, unlike a poll I did in the past about them, showed up a little more this time. I wonder if they are making more of an hobby impact on everyone. Let me know your thoughts on this weeks poll. I am going to give Poll Friday a little time off. With downed voters it seems what I thought would be fun, isn't going to work with the lack of voters. However, it may return if a return in a week or two. I have some other things lined up to take its place. 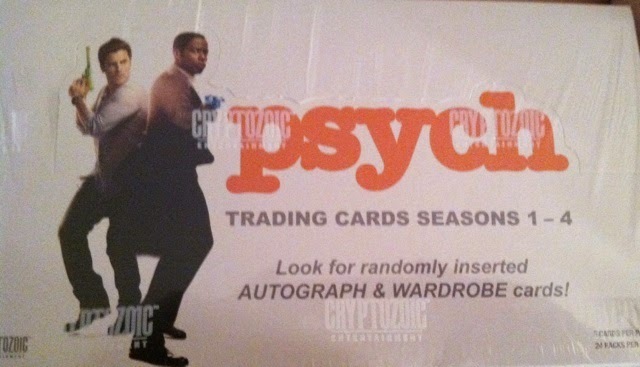 Such as a NEW segment on Vintage cards. Another NEW segment on Collecting The 90's where I will be posting some pack and maybe even box breaks from the 90's my favorite era of collecting. I also have some more posts done on the Collecting Basics series. So for now enjoy the results from last weeks poll and hopefully look for more Poll Fridays down the road. 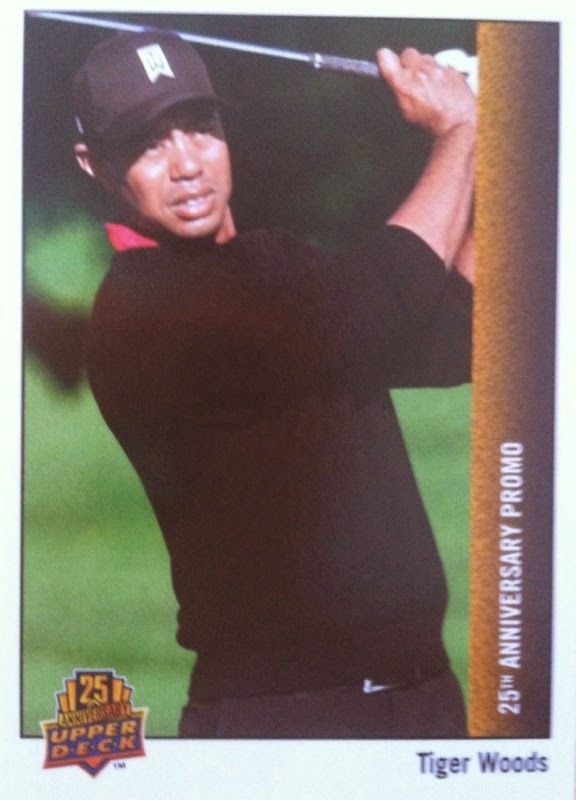 Which Companies Do You Buy Cards Of? 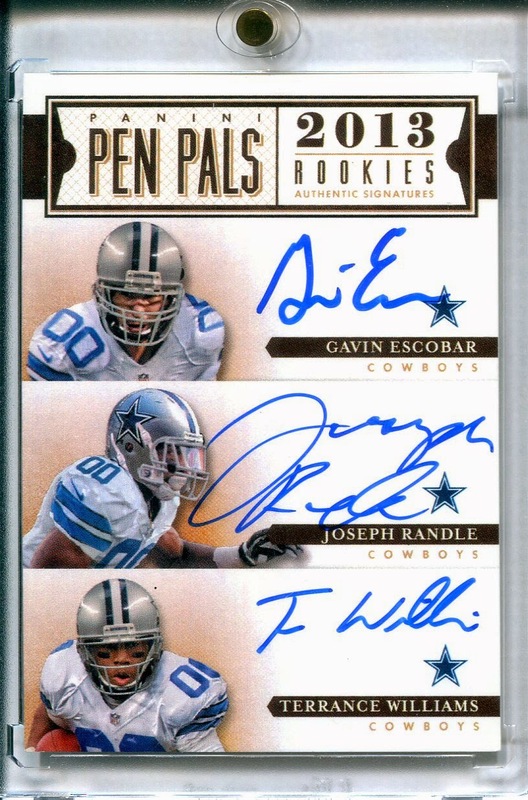 Labels: Leaf, Panini, Poll Friday, Press Pass, Topps, Upper Deck, Which Companies Do You Buy Cards Of? In this edition of What's In The Mail Box?, I recently was up late scouring eBay when I found this lot. 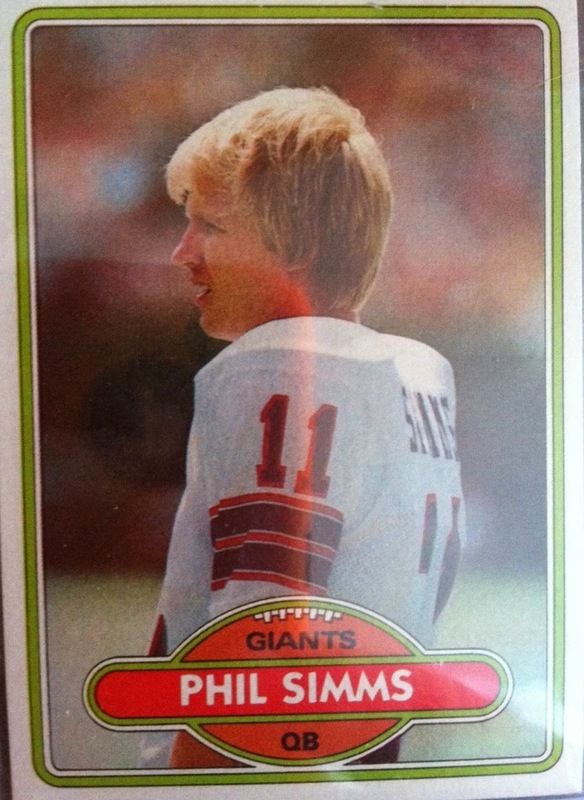 This wasn't just any ole card, IT WAS A PHIL SIMMS ROOKIE CARD! At that point I bid on the lot and kept paying close attention not wanting to lose out. 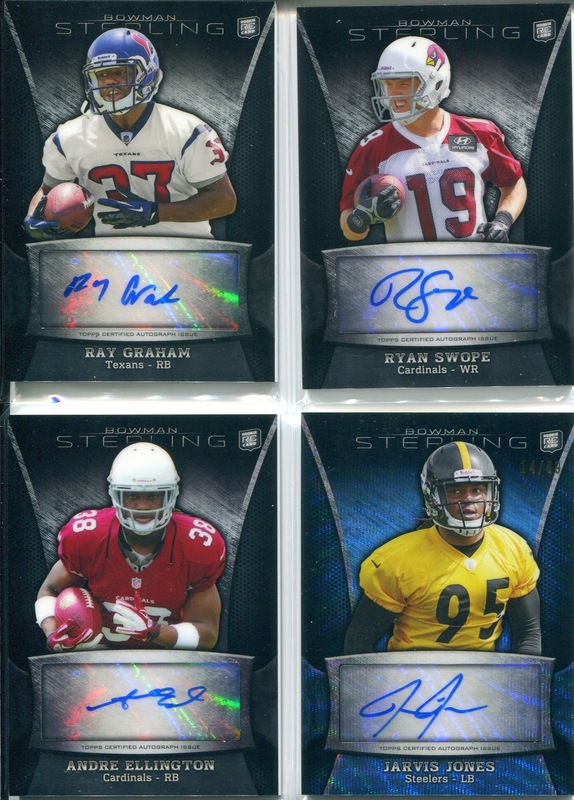 The rest of the cards were nice added bonuses but the sugar in the pot I really wanted was the Simms. Two hours passed and still no bids but mine. Was I honestly going to get this for .99? 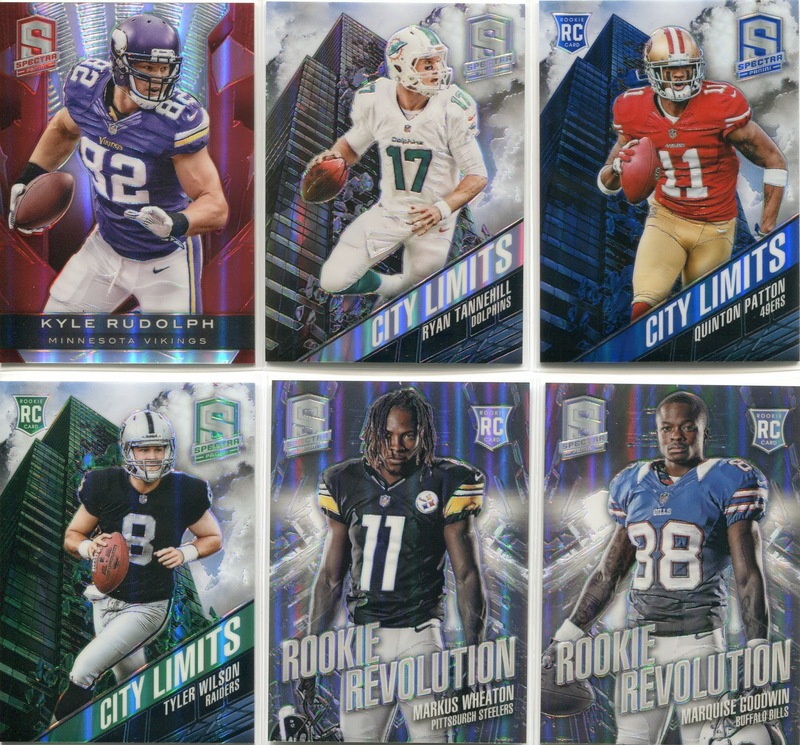 Sure enough the final 30 minutes counted down and in my possession soon would be a Phil Simms rookie card (among 8 others) all for .99! Wow! What a steal! 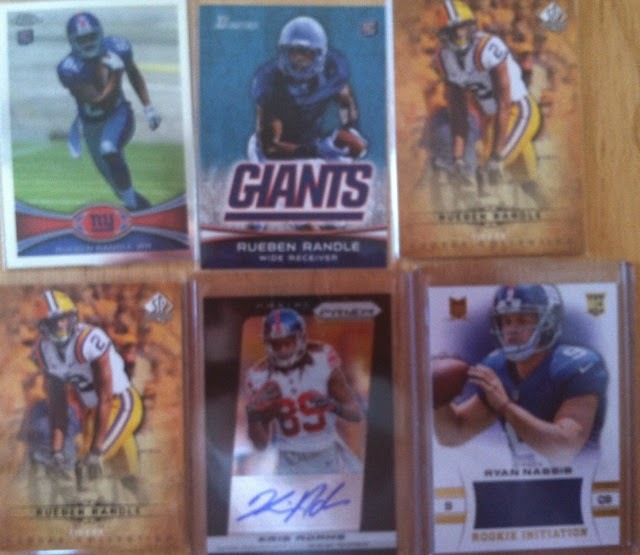 I have since then gotten the Simms in the main and now the Simms is officially in hand and in my Giants PC where he will stay for many years to come. 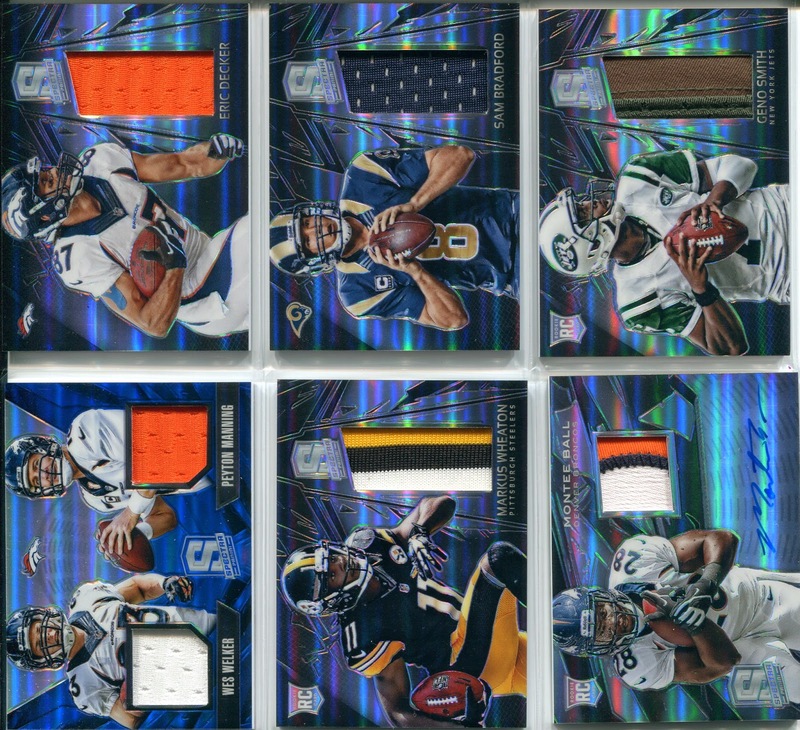 Labels: 1980, 2014, Phil Simms, Rookie Card, Sport Card Collectors, What's In The Mail Box? After 8 seasons, it's hard to say goodbye to such a great show. I still am wondering what USA Network was thinking about when deciding to pull the plug on this one. With a mix of detective work and comedy, it was a great blend with an incredible cast of characters. I am posting this review on the day of the final episode as a way to say goodbye and thank you for the many on the edge of your seat moments, humor and maybe even a few tears. 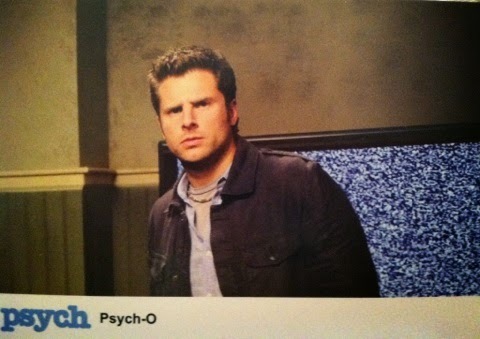 Thank you Psych and I will continue to watch you on DVD. 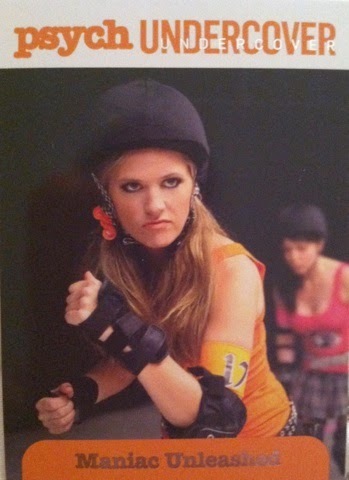 Full action shots of the actors and biggest scenes from seasons 1-4 all captured in 63 cards. I think Cryptozoic did a great job here capturing some of the best moments that stood out to me and looking back through them I can remember each of the scenes. The back of the card is a little displays another picture from the scene on the front with a small writeup about it. 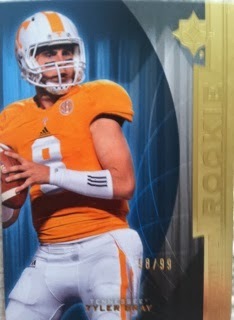 I like the design here as it is wide open for the base cards. The inserts are in need of a little work. Not to much glimmer on the Incognito and Henry's Wisdom ones (though I do like they put Henry's face at the bottom) but the Psychic Moments was my favorite with the rainbow foil making it seem Psychedelic. 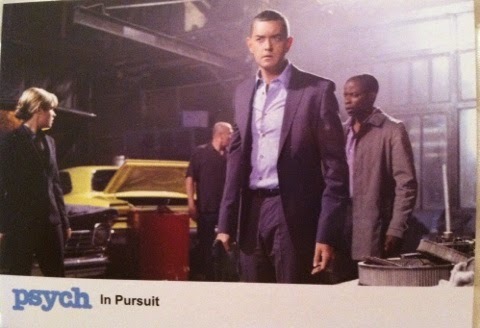 The Incognito insert features Shawn and Gus with a little dab of Juliet in some of the undercover garb they wear. Which alone is hilarious to look at. Henry's Wisdom is lessons that Henry teaches Shawn, which we all know he wants nothing to be apart of. 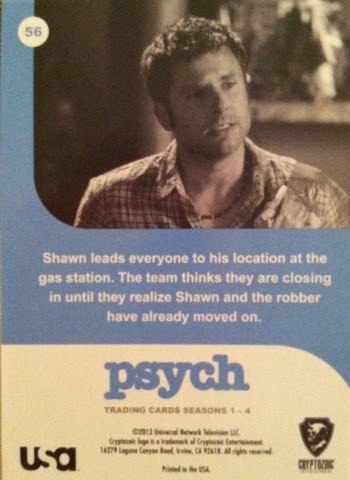 Finally the Psychic Moments reveal some of Shawn's big psychic moments on the show. I got this box for $35. But the moments are priceless. 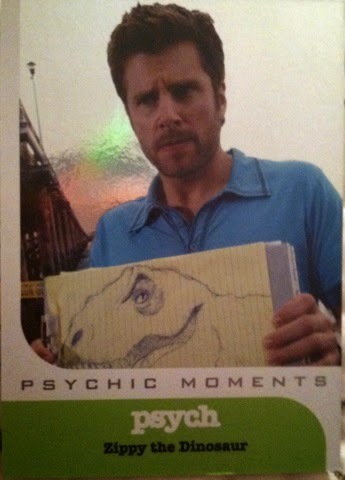 I think I did really good on this break by hitting the best Wardrobe card and one of the better autographs. In every box you get a base set, a decent amount of doubles. 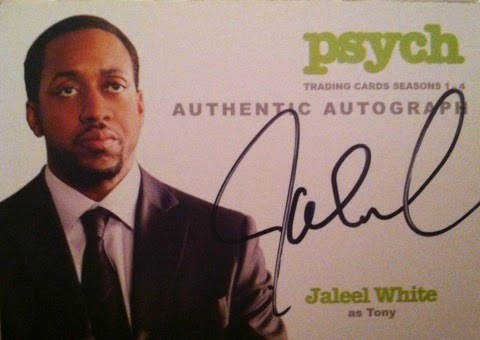 An autograph and a wardrobe card. Early on it may have been a little steep of a purchase for $60+. But right now, under $40, I will eat this up all day everyday with a side of pineapple. Thanks to our friends at The Pack Gambler, we are hosting a contest to celebrate baseball's Opening Day! I know I for one am ready for the sound of bats cracking, the smell of fresh cut grass and crowds cheering. Not only is the thought of baseball's Opening Day exciting, but the other fun thing is...this contest is open to both U.S. and Canadian Residents! If there is a fourth tiebreaker needed, it will be randomed. PLEASE MAKE SURE YOU ARE FOLLOWING THIS BLOG, US ON FACEBOOK OR TWITTER OR FOLLOWING THE PACK GAMBLER. There have been a lot of lost contest prizes when a winner doesn't claim them and never returns to know they won. 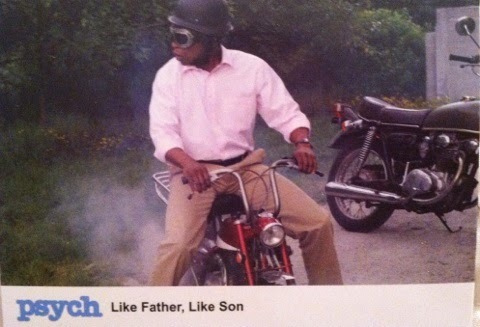 Please make sure you keep this blog on your radar. This is the only place you will find out who wins. Your entries are due by 7:00 pm e.t. on Wednesday, April 2nd 2014. Please say thank you to The Pack Gambler (click onto their name to visit their site) for sponsoring this contest. And most of all, have fun and good luck! 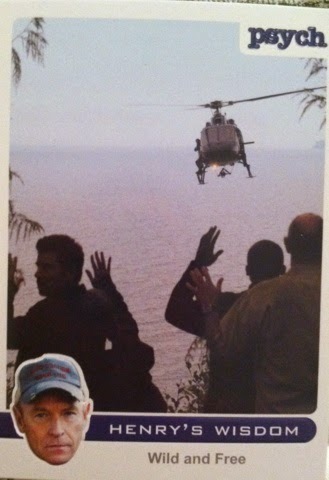 After three randoms, my favorite randoming number, the winner is Harold Tourjee. Congrats to Harold on the win! 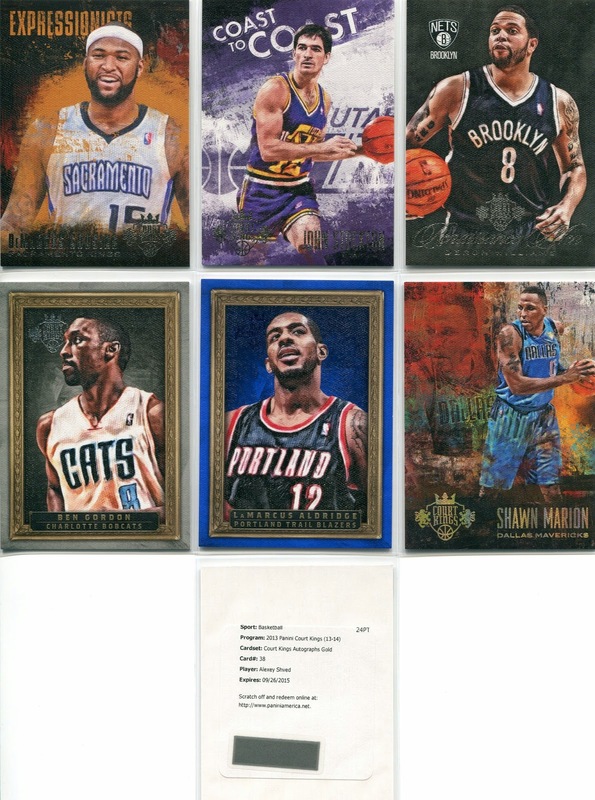 Harold, please contact me at sportcardcollectors@hotmail.com with your address. You have 7 days from today to claim your prize or it will be re-given away. As for more contests, I will be doing more of these in the future so keep an eye out! There will be a variety of players still to come. But, for now, be prepared for the return of the monthly contest. 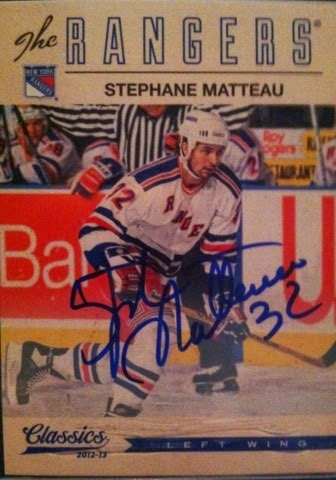 Contest info, rules and prizes will be announced Thursday or Friday so stay tuned! I normally don't do a lot of trades being a card hoarder (one who has HUGE problems letting go of cardboard) and having issues with not knowing who to trust. 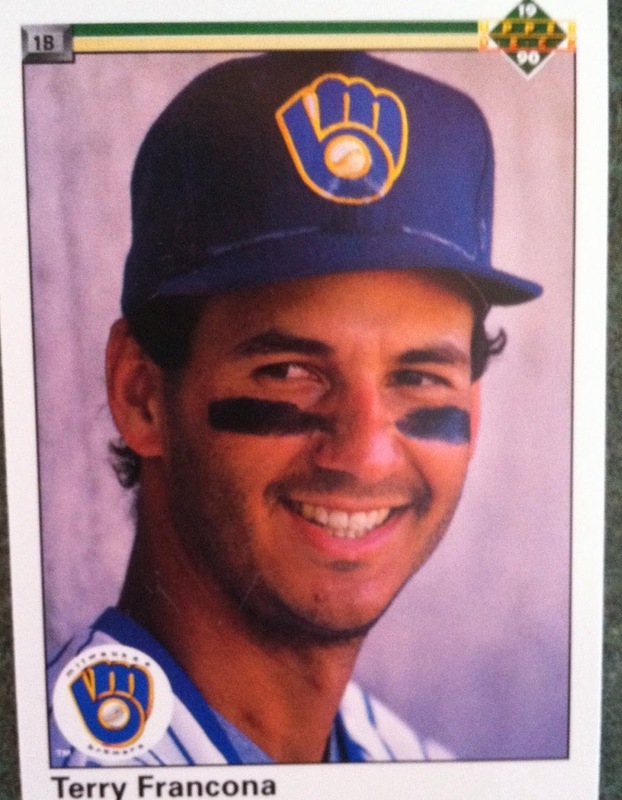 But on this particular day I was fine with doing a trade when Tim Yount approached me about a card that I had. I have known Tim for a couple of years through Facebook on the Upper Deck page and on Twitter. I just knew he would make a great trading partner as he proved so below. 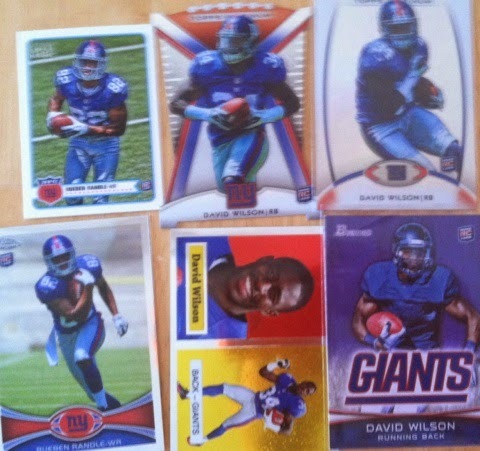 Which I was more than fine trading (surprisingly I was able to let go of a rookie card, very rare) and in return I requested the usual NY Giants and Rueben Randle. 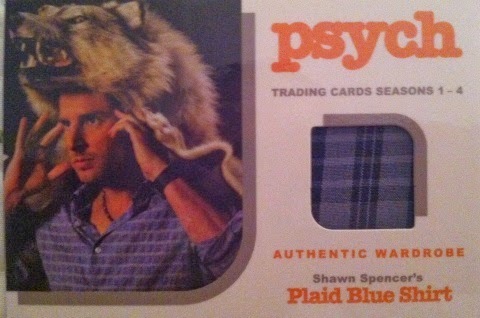 I didn't ask for any amount of cards and said "just send me what you feel is an equal trade as I trust you." This was way more than I expected. All of these will be great additions to my PC (one of many different ones). I can't even pick a favorite from the group. 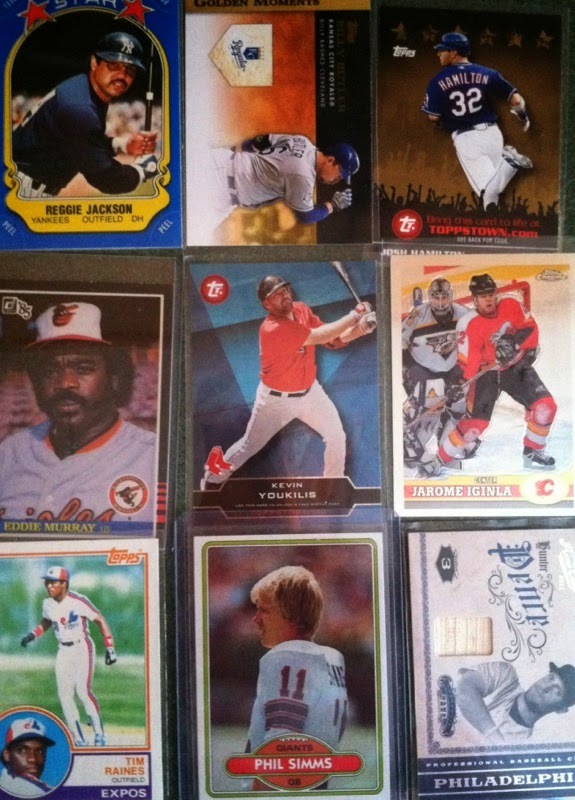 Thanks again Tim for making this trade and for the incredible cards that you sent to me in return. You are a great guy and hobbyist. 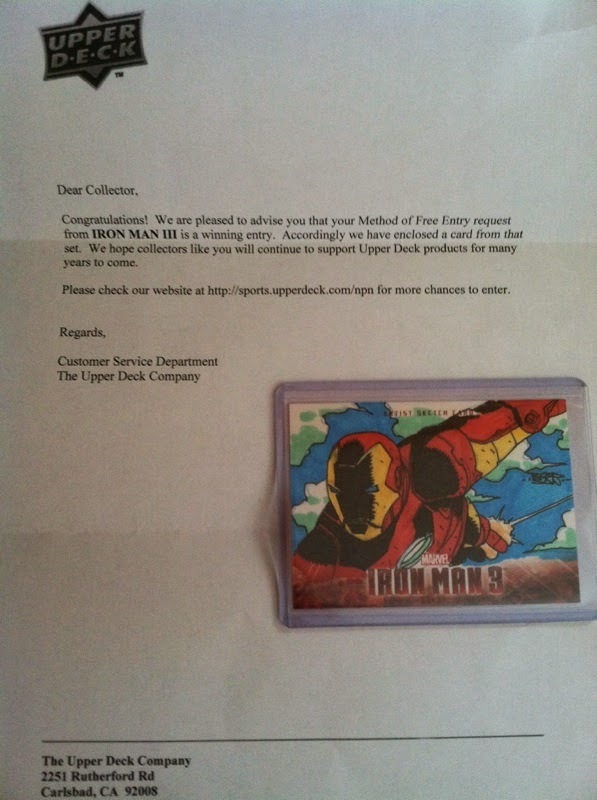 NOTE: he also sent me another card for free that I really wanted. That will be saved for another post. 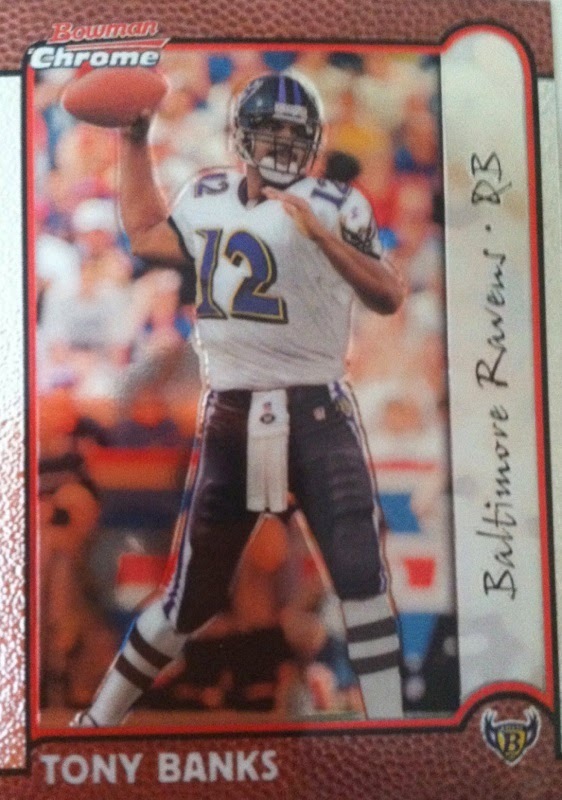 As always, I am open to comments on my mail days and if you haven't done so, go follow Tim on Twitter. You never know when you might need to make a trade with him. 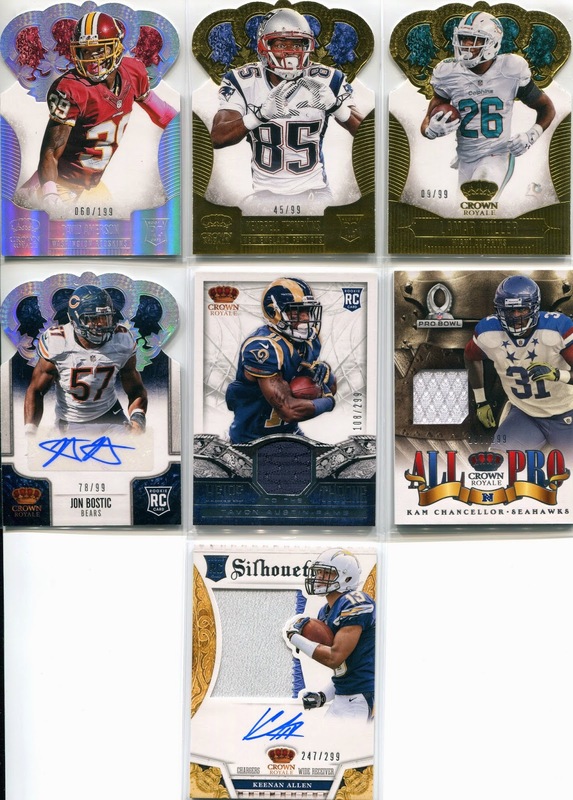 Labels: 2012, Autograph, Bowman, Rueben Randle, Tim Yount, Topps, Trade, What's In The Mail Box? 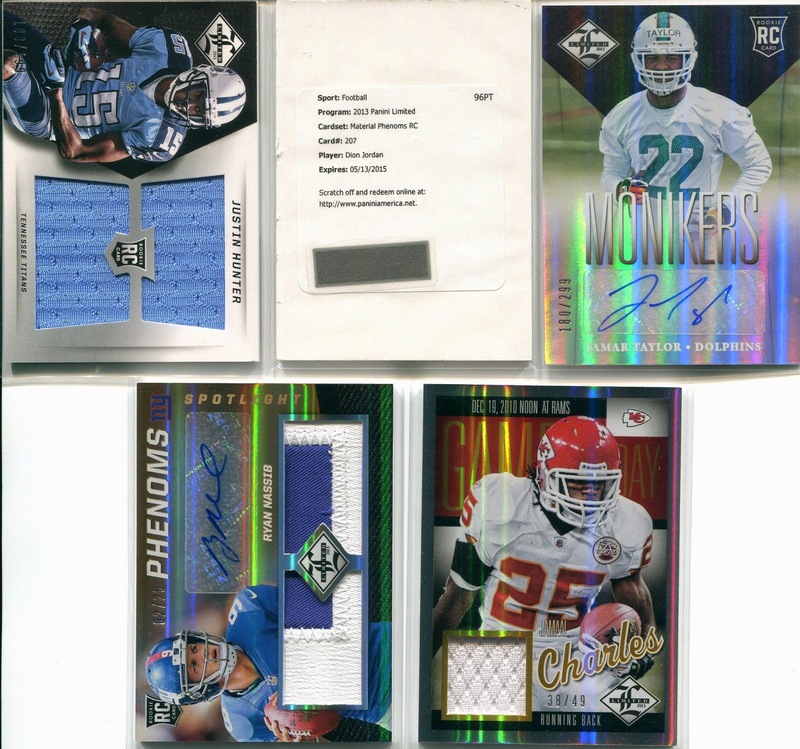 Another week of breaks has gone by for Jammin JDcards and some more nice hits were found. If you think about it, they pretty much have been hitting one monster a weekend and a ton of other really nice hits. 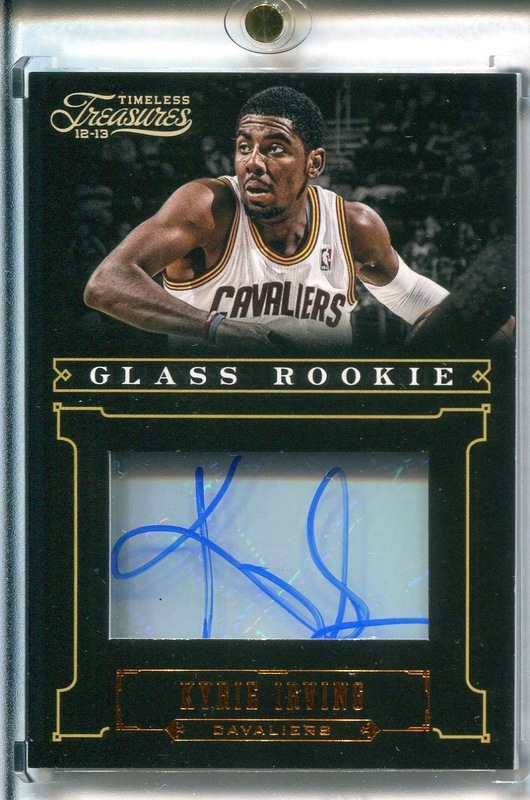 Boom a really sweet Kyrie auto!! 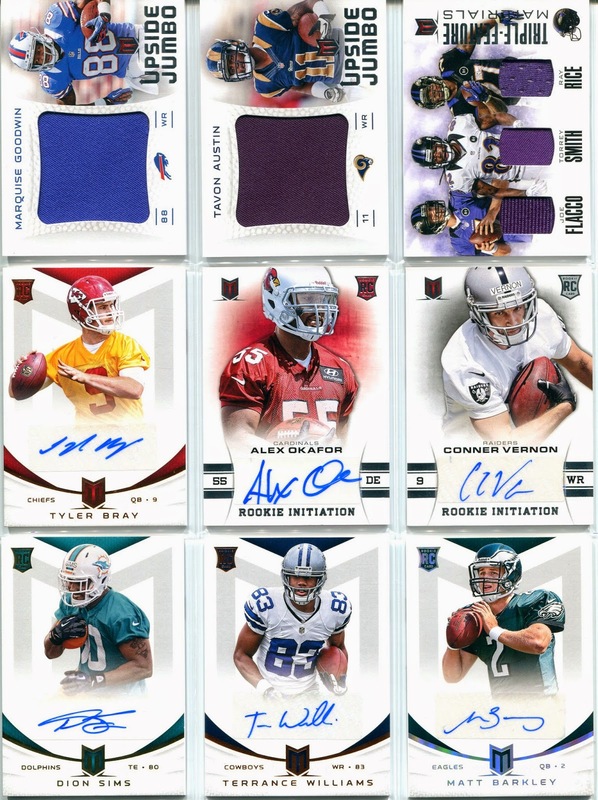 Some nice patches here...just look at the Nassib! 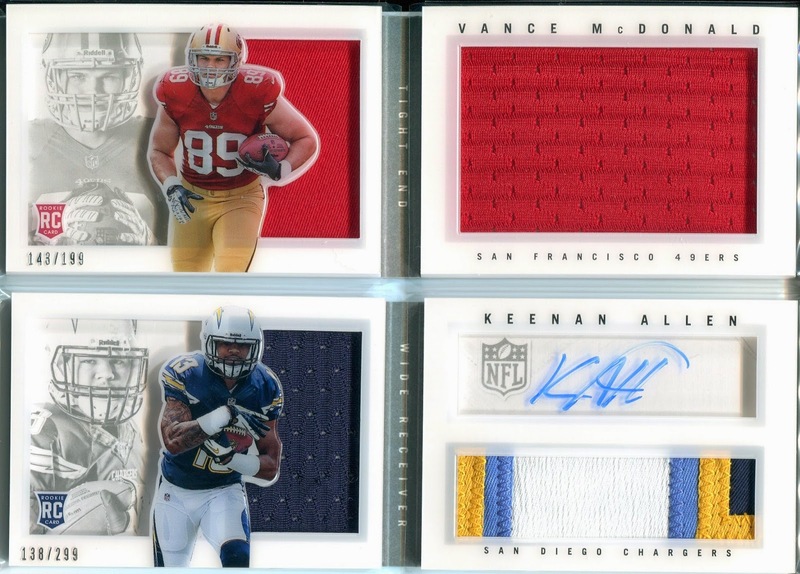 Runner-up Offensive Rookie Of The Year Keenan Allen showed up to the Jammin JDcards break party a couple of times! 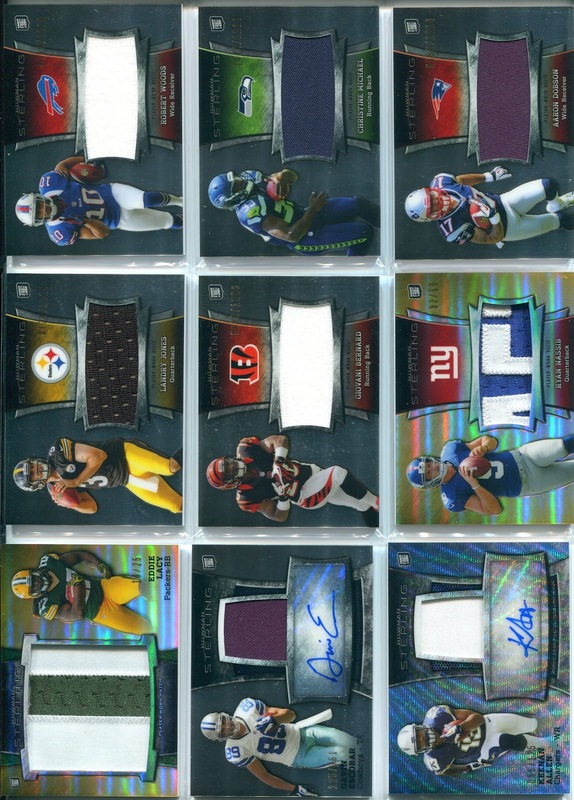 Look at this simply amazing AJ Green patch! 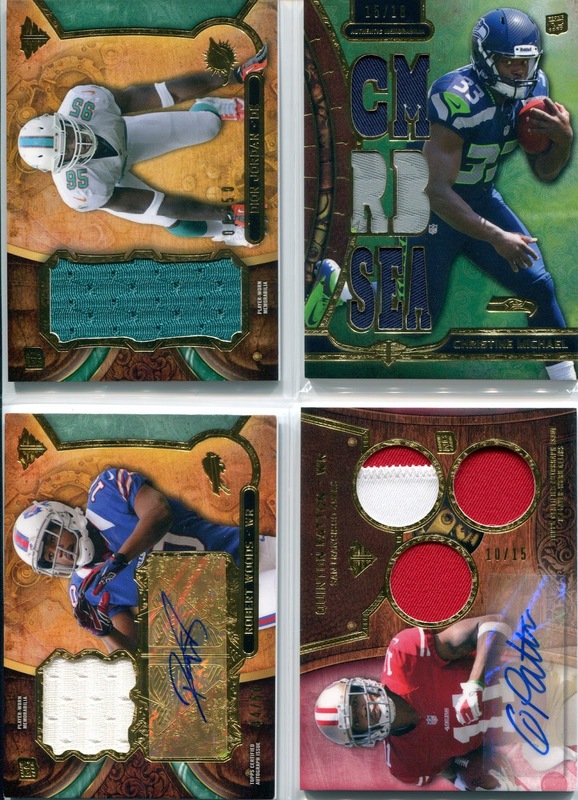 If you like what you see here and haven't yet given Jammin JDcards breaks a try, please do. 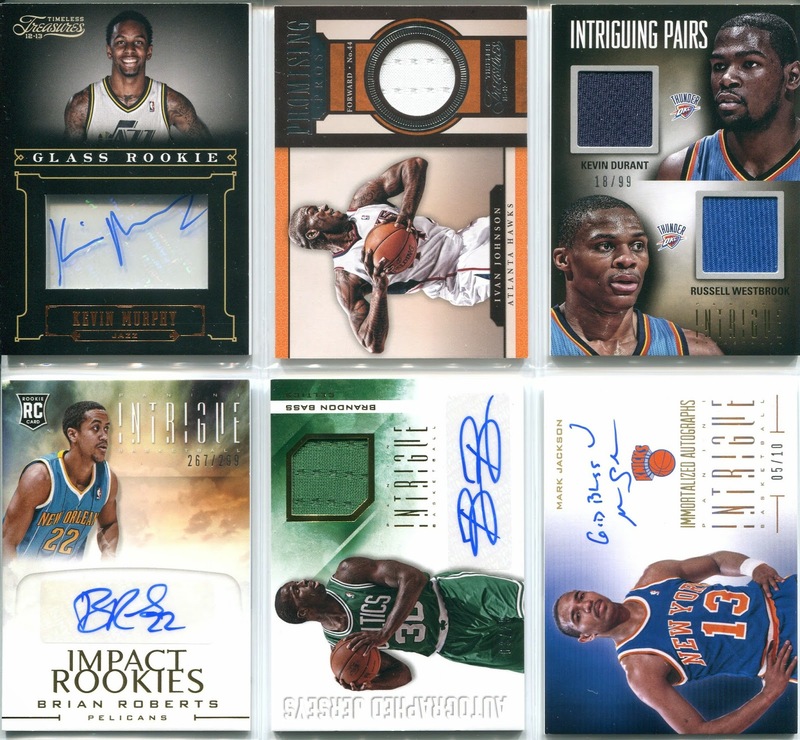 Good prices, great shipping time, top notch customer service and big hits waiting to happen. NOW THEY EVEN BREAK TWICE A WEEK! You can find out what breaks are next right HERE. Good luck if you give them a try and let me know what you hit! WIN!! These Nolan Ryan/Derek Jeter Cards! Collecting Basics 2: What To Open?